Stepp joined the Razorbacks after spending six seasons as a wide receivers coach at SMU (2015-17) and Appalachian State (2012-14). Prior to Appalachian State, he spent three seasons at Clemson as an offensive graduate assistant coach (2011) and an offensive video graduate assistant (2009-10). Last December, he was selected to participate in the 2018 AFCA 35 Under 35 Coaches Leadership Institute, a prestigious program aimed at identifying and developing premier, future leaders in the football coaching profession that will take place on Jan. 7, during the 2018 AFCA Convention in Charlotte, North Carolina. He was also named a finalist for the 2017 FootballScoop Wide Receivers Coach of the Year award. During Stepp’s six seasons as a wide receivers coach, he’s tutored three different players who have combined for four 1,000-yard receiving seasons. Stepp’s protégés Courtland Sutton and Trey Quinn at SMU were two of the most dynamic wide receivers in college football in 2017 and each went on to be selected in the 2018 NFL Draft. The Mustangs boasted one of the most prolific passing attacks in the nation on the strength of All-Americans Sutton and Quinn each posting 1,000-yard receiving seasons. SMU was one of only two schools with multiple 1,000-yard receivers in 2017. In addition, Sutton and Quinn were the only pair of teammates to rank in the top 10 in touchdown receptions and combined for 12 100-yard receiving games with six apiece. Quinn finished the year with 13 TD catches, while Sutton had 12. A Biletnikoff Award and Earl Campbell Tyler Rose semifinalist, Quinn led the nation in receptions with 114 and ranked inside the top 15 nationally in receiving touchdowns (No. 4, 13), receiving yards per game (No. 10, 95.1) and receiving yards (No. 11, 1,236). He turned in two of the three top reception performances in the FBS during the regular season with 17 catches twice and became the only player this century to register 15-plus catches in three straight games. The Lake Charles, Louisiana, native was selected by the Washington Redskins with the 256th and final selection of the 2018 draft. Sutton, a second-round pick to the Denver Broncos, posted career receiving totals of 3,152 yards and 31 touchdowns on 189 receptions in four seasons at SMU. He averaged 16.4 yards per catch in each of his last two seasons, and finished third on the Mustangs’ all-time receiving chart behind Emmanuel Sanders and Aldrick Robinson. In 2016, Sutton led the SMU offense for the second straight season, hauling in 76 passes for 1,246 yards and 10 TDs to become SMU’s first 1,000-yard receiver since 2013. Sutton was not the Mustangs’ only threat through the air, though, as James Proche, caught 57 passes for 709 yards and six scores on his way to Freshman All-America honors. Stepp’s first season at SMU saw him develop Sutton into one of the country’s top freshman. Sutton was named a Freshman All-American in 2015 after leading all FBS freshmen with nine receiving touchdowns. He set an SMU freshman record for receiving yards with 862 and tied Sanders for most touchdowns by a freshman. Over Stepp’s first two seasons at Appalachian State, he coached three players who combined to earn five All-Southern Conference honors, including All-American Sean Price who set NCAA Division I FCS freshman records with 81 receptions and 1,196 receiving yards in 2012. In 2011, Stepp played a key role in Clemson’s offense, alongside Morris who was offensive coordinator. Stepp worked directly with the Tigers’ running backs, quarterbacks, wide receivers and tight ends, while assisting in game-planning and in-game play-calling adjustments. With Stepp on the sideline, Clemson ranked second in the ACC and in the top 30 nationally in scoring (33.6) and total offense (440.8) and boasted a pair of all-Americans on the offensive side of the ball. 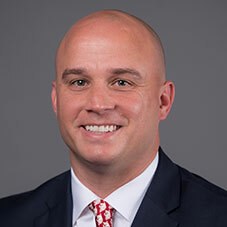 Stepp got his coaching start as the wide receivers coach and recruiting coordinator at NCAA Division II North Greenville in 2008. He also served as wide receivers and strength coach at Fort Mill (S.C.) High School in 2007. Stepp was a standout wide receiver and punt returner at Furman from 2003-06. He earned All-SoCon recognition as a junior and senior and finished his playing career with 1,568 yards, 10 touchdown catches and 118 receptions, good for No. 4 on the school’s career list at the time. Stepp and his wife, Brooke, have a newborn son, Courtland Spencer Stepp, and a dog, Holi.